It has been almost two months since we had to cancel out 10th Anniversary trip to Walt Disney World. TechyDad and I had planned a five night stay in Orlando without the kids. When we finally decided to splurge and go to a location for our ten year anniversary, Disney just seemed natural to us. A magical honeymoon and subsequent trips back with the kids made it a quick and easy choice. 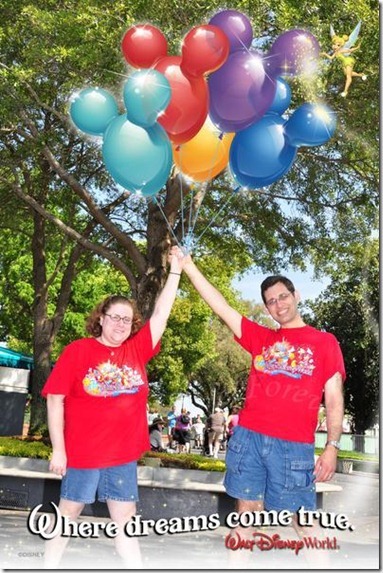 We were going to bring the kids to stay with Bubbe and Grandpa while we went to Disney alone. Then, as I wrote after the case Mother Nature had other plans. Looking back at the trip that never was makes me sad. I see people Tweet and talk about restaurants that we had advanced dining reservations for. What was harder at the time, I saw pictures from people at the parks Labor Day weekend and the Magic Kingdom was decked out in fall decorations. Each time I saw a picture, a piece of my heart crumbled more and more. Of course, as time moved past the trip, I was ok. I knew that we made the right choice. We were responsible adults. Then, as school started, there was no time to dwell on what could and should have been. I was focused on getting the boys back into the swing of things. We had to adjust to nursery school five days a week and life in third grade. Now, it is almost November and my heart is heavy again. I long for a time to get away with TechyDad. We are trying to see if we can figure out a time that will work for us to get away. It will probably have to wait until the kids are done with school because their crazy schedules really do complicate things. Nothing is really set in stone yet, but I think about it often. I wonder when we may finally get a chance if we will be able to get reservation to California Grill in time for the fireworks. Will we be lucky enough to snag a time to eat at other places that were on our agenda? I suppose only time will tell. Until then, I know that we were safe during the storm, and that we will one day have a magical adventure to our favorite destination again. P.S. I am not the only one that wrote about our trip that never was. TechyDad also did a Travelogue of the Trip That Irene Canceled – Part 1 and Part 2. Oh, I hope you get a do-over! Aw, I’m sorry it didn’t happen for you. We have a cruise planned in December and my heart will break if the weather prevents us from getting to Florida on time! Don’t give up your dream, you deserve to go!